Maybe 3 doesn’t really consitute a gang. 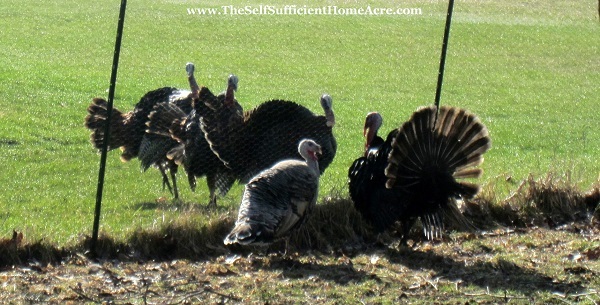 We have a lot of wild turkeys in the area, and I often hear them calling to my little flock. The turkey hens have shown great interest in the calls, especially since they didn’t have a tom. I borrowed a tom, ‘Dude’ from Trogg’s Hollow CSA, and the other day these 3 bad boys showed up! 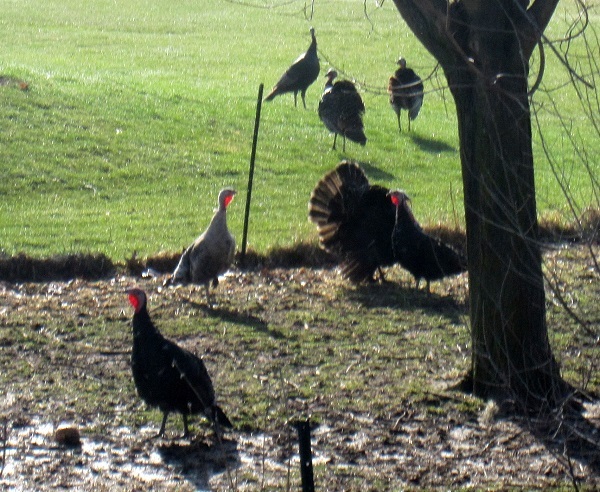 They got right up to the fence and started to display and call to the hens. They started clawing at the fence and acting very aggressive to Dude (a cross between a Black Slate and Narragansett). The hens were definitely interested in the whole affair. I chased the wild turkeys away. I was worried about diseases and fights. It took a couple of sessions of me chasing these guys off before they left for good, I hope. These 3 wild ones keep coming back to court the hens. Dude has gone over the fence to defend ‘his’ territory twice now. The second time he got thoroughly trounced by the three intruders. I had to chase them away and then catch Dude to put him back in the pen. He still thinks he won the fight…but we know better! 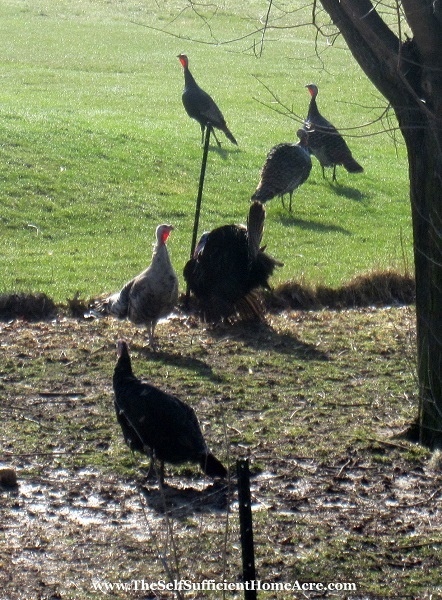 I’m hoping that all this ends and the wild turkeys stay away. 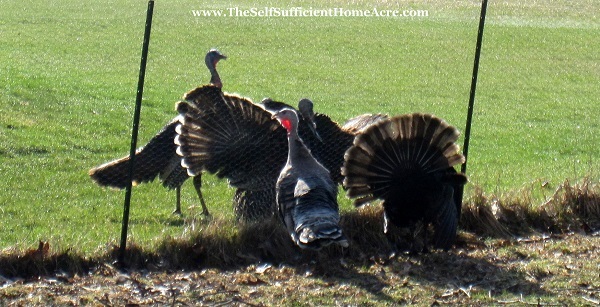 Honestly, I never thought I’d be chasing wild turkeys around! 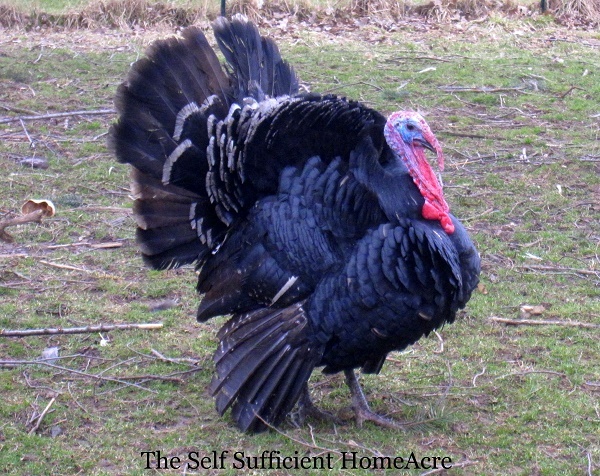 Do you have heritage turkeys? 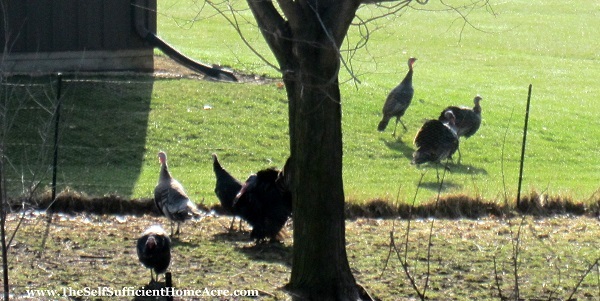 Do wild turkeys come to visit them?